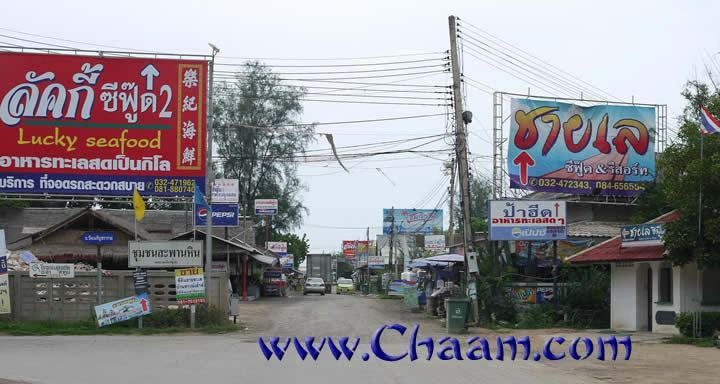 Directly at the end of the northern part of the beach of Cha -Am you will find the small fishing village where you can find the best seafood restaurants in Cha-Am. 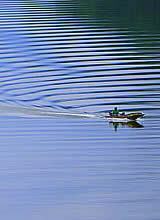 To enlarge the pictures please click on the respective picture! In some displays the restaurants offer living lobsters, crabs and shrimps. There are also aquariums outside the restaurants, where you can can order your living fish, then later you get it prepared so as you like it. Culinary it's a wonderful place to go! 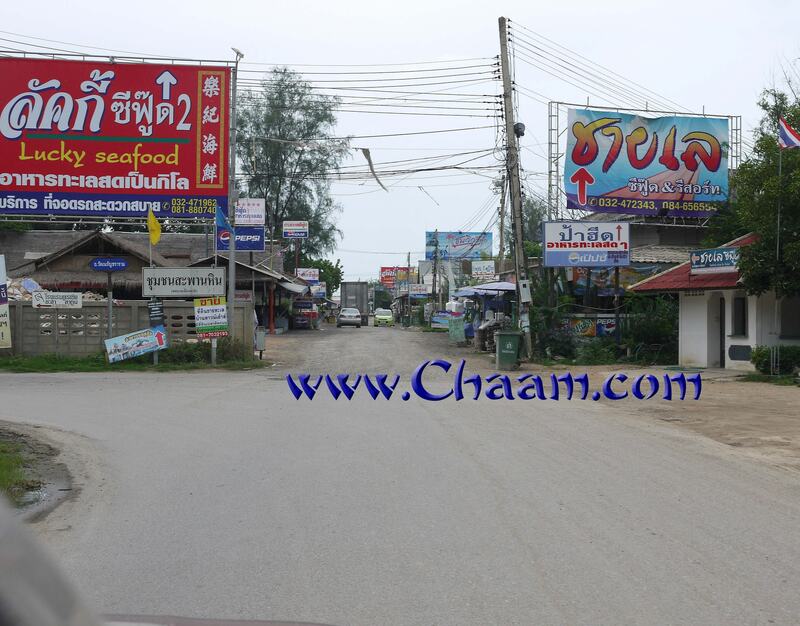 Unfortunately, the landowner of the village broke off many restaurants and fishing huts, so that the streetscape looks at the moment a bit dull. 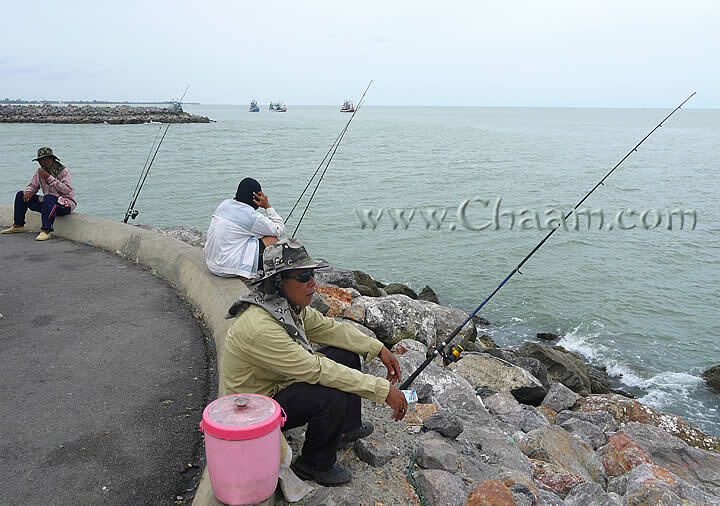 But in the next few months he already wants to start construction of a new fishing village. This boat caught lobster. If you are a lobster gourmet, you will fully get delighted in the restaurants! A small fleet of lobster fishing boats. 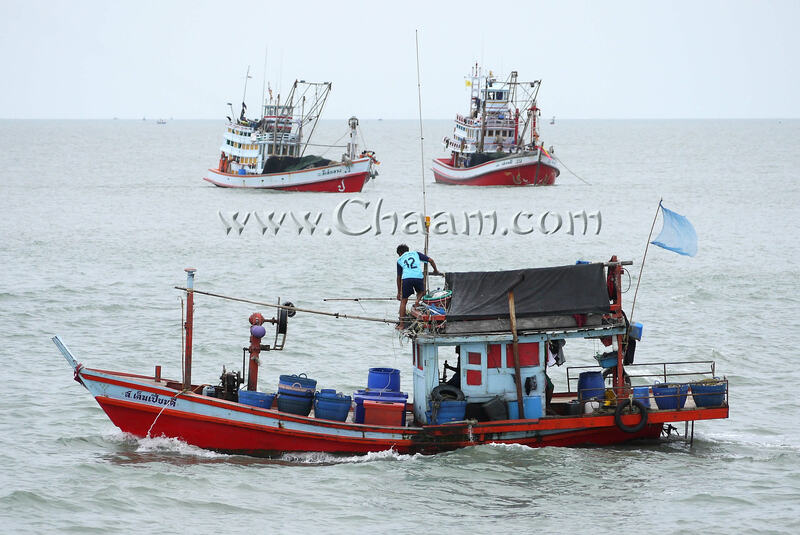 They go out during high tide and put the catch cages on the seabed. The lobsters are crawling in the cages and then they be pulled from the fishermen on board. 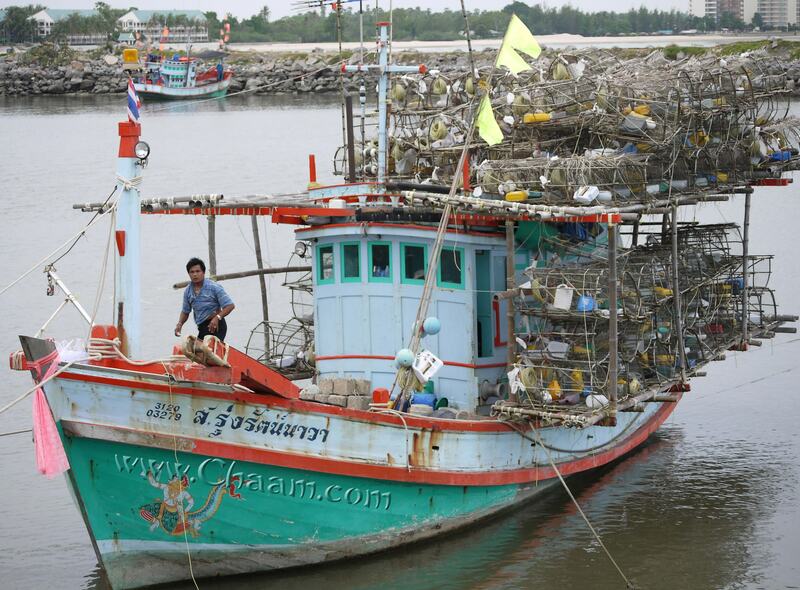 After a heavy typhoon a few years ago this large ship was sunk in the port of Cha-Am. 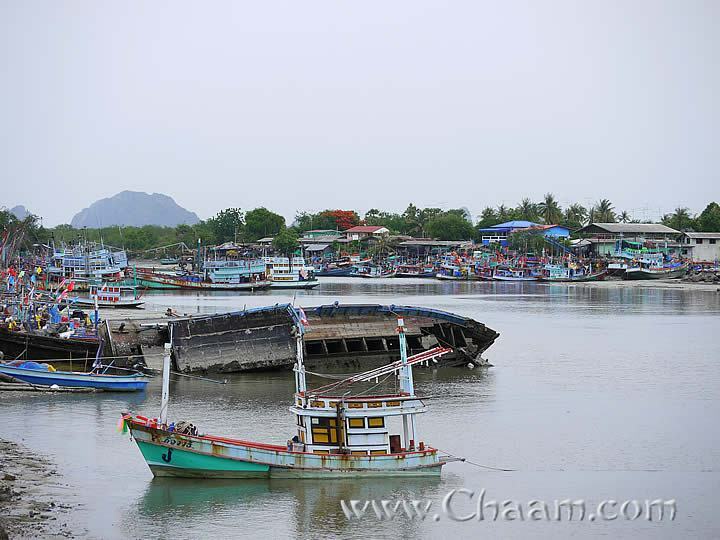 Now the shipwreck creates an idyllic image in the fishing port. 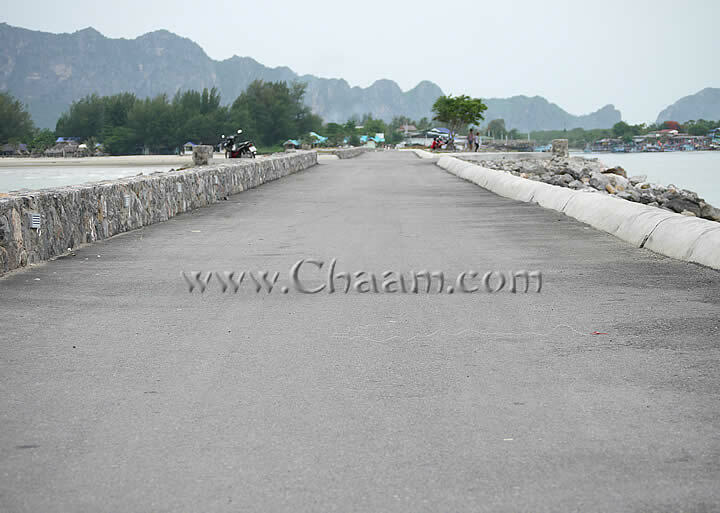 A nice promenade recently has been built in the harbor of Cha-Am. You can now go about a kilometer on an excellent road to the squid monument. 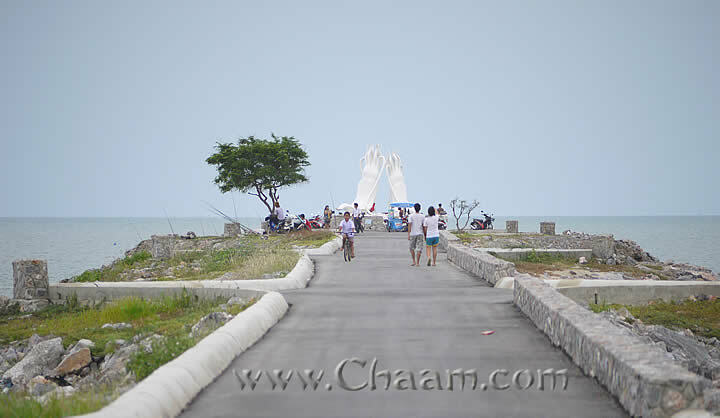 A trip here is worth especially on cloudy weather when the sun is not too strong. 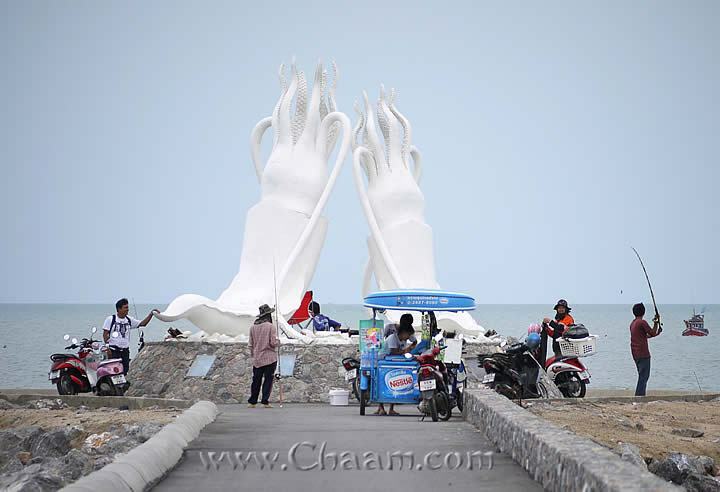 At the end of the promenade, where the octopus statue of Cha-Am is located, is a meeting point for many sports fishermen who catch fish with their fishing rod for their family. And at any location, where are more than 5 Thais , traditionally the small mobile "eating-houses" come and offer food and snacks. Especially recommended are the bran pancakes which are offered with different sweet sauces. However, many big fish are not caught. It's a very cozy place with friendly atmosphere without stress and hectic. 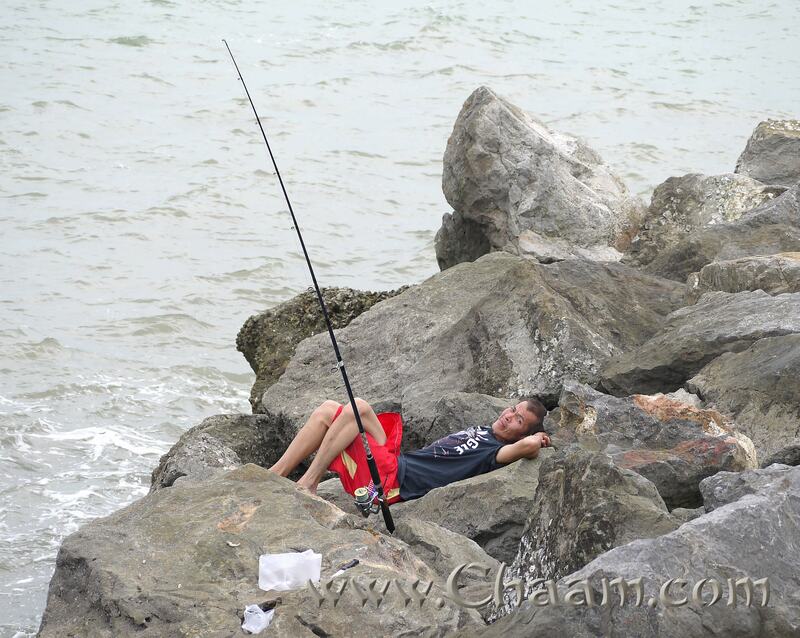 Some anglers have brought multiple fishing rods that they stuck between the rocks. Now they control the movement of the rod and the tendon. 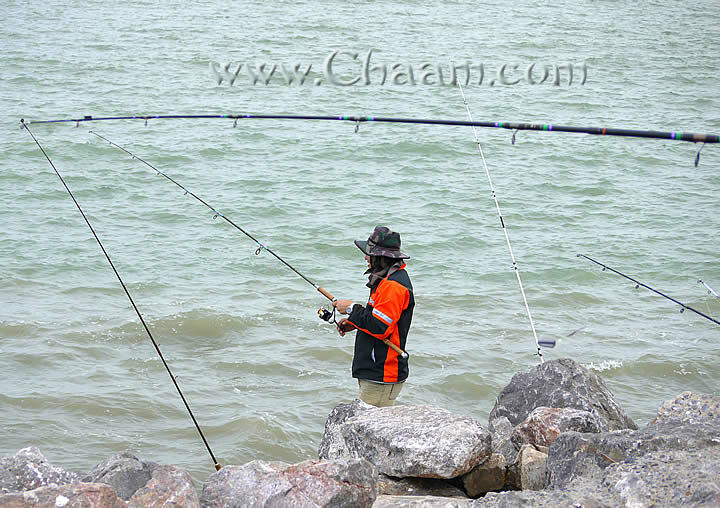 Here a Thai man is angling. He waits in silence for a fish takes the bait. A long walk on the promenade especially recommended for the evening. Directly at the mountains the sun goes down, so you have a romantic walk with illuminations! 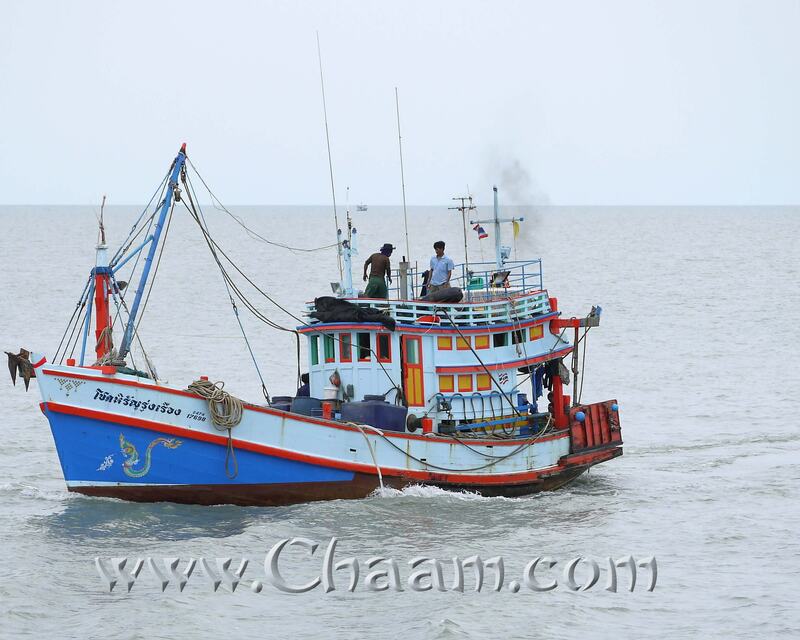 A shrimp boat drives his catch home and chugs slowly to the port of Cha-Am. 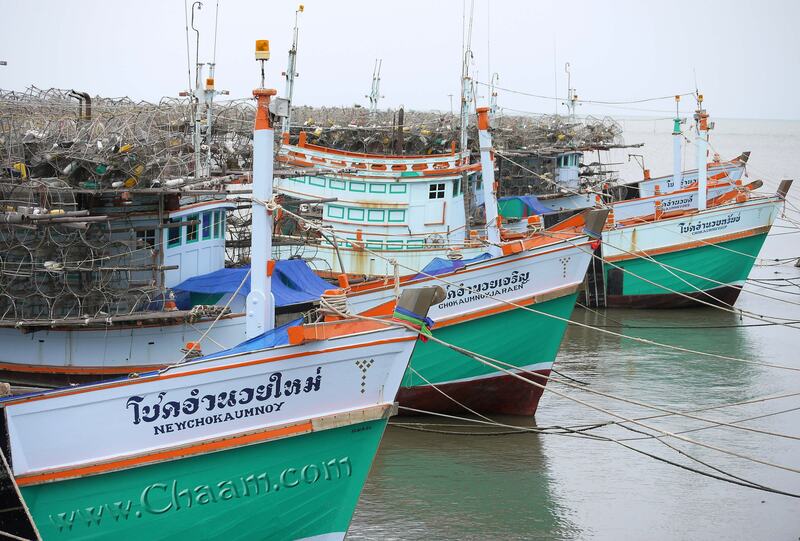 The fishing boats from Cha-Am are mostly built entirely of wood. They are optimally aligned for use in the Gulf of Thailand. 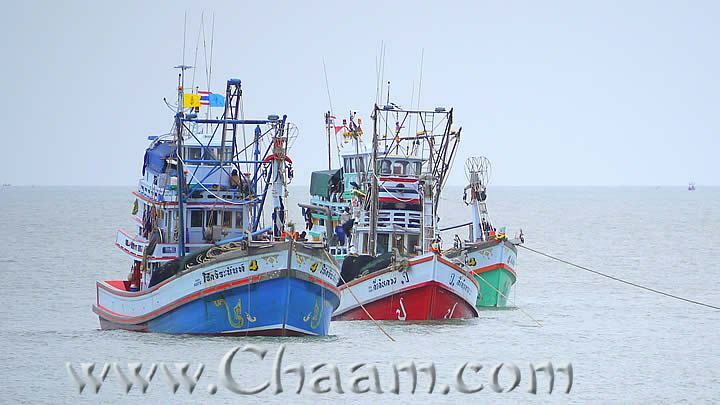 Three fishing boats are anchored here side by side. They pull their fishing nets over the seabed slowly, until they have caught enough fish. Click here to go to >> Part 2 of the fishing village >> where you will see beside fishing boats, the fishermen houses and the small market in the fishing village of Cha-Am.